The Parallel state ("Type": "Parallel") can be used to create parallel branches of execution in your state machine. In addition to the common state fields, Parallel states introduce these additional fields. An array of objects that specify state machines to execute in parallel. Each such state machine object must have fields named States and StartAt, whose meanings are exactly like those in the top level of a state machine. Specifies where (in the input) to place the output of the branches. The input is then filtered as specified by the OutputPath field (if present) before being used as the state's output. For more information, see Input and Output Processing. An array of objects, called Retriers, that define a retry policy in case the state encounters runtime errors. For more information, see Retrying After an Error. An array of objects, called Catchers, that define a fallback state that is executed if the state encounters runtime errors and its retry policy is exhausted or isn't defined. For more information, see Fallback States. A Parallel state causes AWS Step Functions to execute each branch, starting with the state named in that branch's StartAt field, as concurrently as possible, and wait until all branches terminate (reach a terminal state) before processing the Parallel state's Next field. 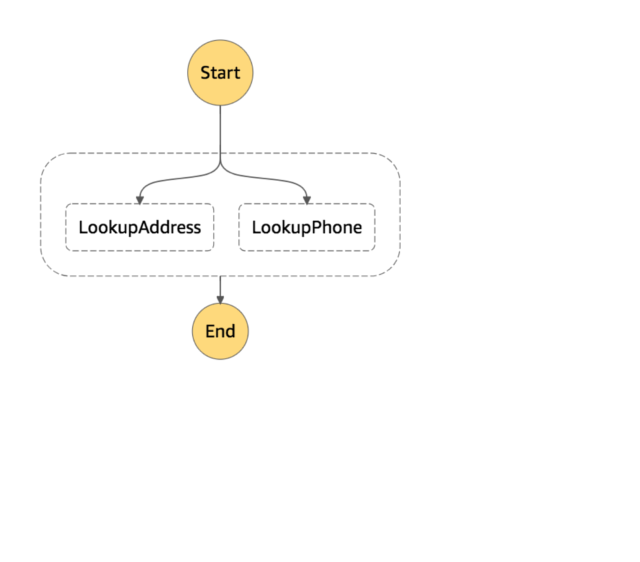 In this example, the LookupAddress and LookupPhone branches are executed in parallel. Here is how the visual workflow looks in the Step Functions console. Each branch must be self-contained. A state in one branch of a Parallel state must not have a Next field that targets a field outside of that branch, nor can any other state outside the branch transition into that branch. A Parallel state provides each branch with a copy of its own input data (subject to modification by the InputPath field). It generates output that is an array with one element for each branch, containing the output from that branch. There is no requirement that all elements be of the same type. The output array can be inserted into the input data (and the whole sent as the Parallel state's output) by using a ResultPath field in the usual way (see Input and Output Processing). If the FunWithMath state was given the array [3, 2] as input, then both the Add and Subtract states receive that array as input. The output of Add would be 5, that of Subtract would be 1, and the output of the Parallel state would be an array. If any branch fails, because of an unhandled error or by transitioning to a Fail state, the entire Parallel state is considered to have failed and all its branches are stopped. If the error is not handled by the Parallel state itself, Step Functions stops the execution with an error. When a parallel state fails, invoked Lambda functions continue to run and activity workers processing a task token are not stopped. To stop long-running activities, use heartbeats to detect if its branch has been stopped by Step Functions, and stop workers that are processing tasks. Calling SendTaskHeartbeat, SendTaskSuccess, or SendTaskFailure will throw an error if the state has failed. See Heartbeat Errors. Running Lambda functions cannot be stopped. If you have implemented a fallback, use a Wait state so that cleanup work happens after the Lambda function has finished.